A HFH affiliate in Gisborne, New Zealand, dedicates five houses one minute after midnight on Jan. 1, 2000, as part of the city’s “Gisborne 2000” Millennium celebration. Gisborne is the first city in the world to see the first light of the new millennium. Decentralization of HFHI management continues as the Asia/Pacific office moves to Bangkok, Thailand, and the Africa/Middle East department moves to Pretoria, South Africa. Seventh book published by Millard Fuller, More Than Houses. Linda and Millard Fuller receive the Mark O. Hatfield Leadership Award from Council for Christian Colleges and Universities. 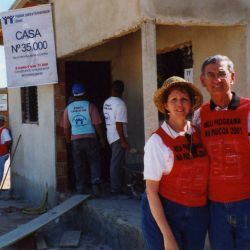 Linda and Millard Fuller in Brazil to celebrate 35,000th house built in Latin America/Caribbean. HFHI is now in 83 nations totaling a milestone 2000 affiliates worldwide. Fullers in Uganda to celebrate 20,000th house built on African continent. 40,000th Habitat house completed in the U.S.
Linda Fuller leads “Women Building A Legacy” launch in Denver, Colo. — 250 women building five houses in one week and celebrating the tremendous success of “First Ladies Builds” (participation of every First Lady of all 50 U.S. states) and now leveraging that to build a much larger base of resources for the Women Build program. The 250 women from U.S. were joined by 15 women from Northern Ireland for this milestone event. Now more than 400 HFH houses built by women or women led builds. JCWP held in South Korea – 136 houses. “Down Home Humor” – funny stories about Habitat published, edited by Linda Fuller. Millard Fuller’s eighth book published — First volume of “Building Materials for Life,” a collection of 40 inspiring essays which Millard bases on his life and faith experiences. Millard Fuller named Georgian of the Year by the Georgia Association of Broadcasters. JCWP in Durban, South Africa – 100 homes in five days as part of 1,000 homes built all over Africa in three months. Shelby Co., Ala. HFH Breaks record for fastest house built in the U.S. — three hours, 26 min., 34 seconds. Jacksonville, Fla. HFH affiliate is the first in US to achieve 1,000 houses. 21st Century Challenge reaches 37 certified communities. Global Village and Discovery Center opens in Americus, Ga.
Millard and Linda travel to Cluj, Romania to dedicate 150,000th HFH house completed worldwide. JCWP — Three 21st Century Challenge cities: LaGrange and Valdosta, Ga. & Anniston, Ala.
CCYP — $1 million raised by students contributing to HFH affiliate building efforts. “Briars in the Cotton Patch” documentary on Koinonia released — produced by Faith Fuller, daughter of Millard and Linda. Millard Fuller named CEO of the year among nonprofits in the U.S. by the Non-Profit Times. Millard Fuller’s ninth book, “Building Materials for Life – Volume II” published. March: Linda and Millard Fuller tour and spread awareness of Habitat’s work in Asia. Millard has disagreements with Habitat for Humanity International board. May: Millard receives milestone 50th honorary doctorate degree. August: Conflict with HFHI board continues. (Details in “The House That Love Built” by Bettie Youngs) Millard and Linda receive the Points of Light Medallion, recognized for philanthropic excellence by former President George H.W. Bush. November: Paul Leonard becomes Interim CEO. Millard continues as President and Founder. December: Millard receives World Methodist Peace Award from the World Methodist Council.